Just having the thought at the beginning of the new year, "How can we make this year better?" is a powerful thing. Beginning a new season of camping on a positive, fun note is the best way to begin anything. 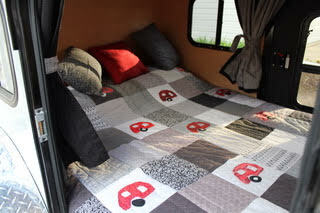 A new year of camping for tiny trailer owners sings its possibilities to us, sweet and full of sunlight. Even in January, spring seems just around the corner. What new roads will we choose? What new campgrounds or boondocking sites will we discover? What new toys and tools will we pack and use? What new friends will we make? 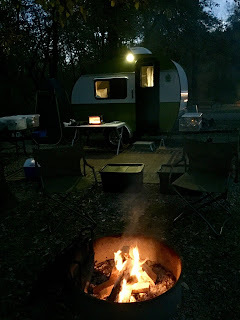 Posting on three Facebook tiny trailer groups, I've gathered the word on the streets (and trails) for what's the haps for 2019, and our camping dreams are much aligned like auspicious stars to the questions above: dreams of travel, beautiful landscapes, tools tried-and-true or cutting edge, and good company and conversation. 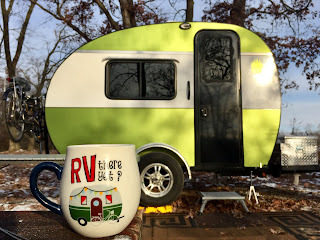 Read on and see how your resolutions for the new year match with other tiny trailer campers. For some of us, it was Enough stuff! and for others, it was Can't get enough! Are we surprised? One camping couple said, "Not to buy any more stuff. Don't need stuff because most monthly trips are short. Less is more." The idea of minimalism was a common theme, with some adding, "We want to start using what we pack!" 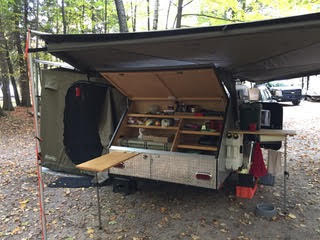 A couple of campers were waiting to purchase a new camper, and one camper was resolved to remember that "just because I will soon have a hard-sided camper instead of a popup doesn’t mean I can put more in it." Do modifications to the trailer count? One couple was planning to begin the new year's camping with a new axle and tires for the trailer, and solar was a topic mentioned several times. Adding bicycling or kayaking sweetened the trip for some, while another happy camper wanted to add some golf junkets to next year's season of camping. 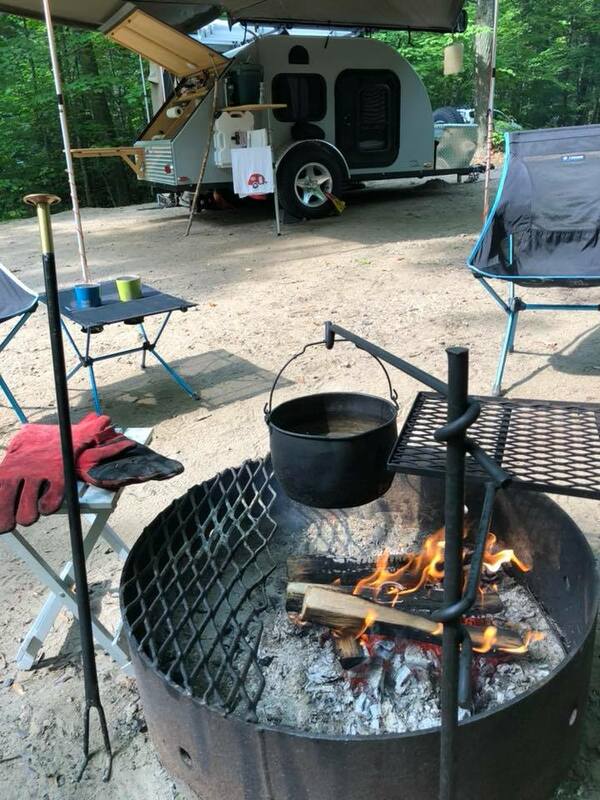 Although not a cross adventure but definitely a new experience, one camper wanted to learn how to cook with a dutch oven over the campfire, while another camper wants "to try more open fire cooking with my cast iron and use my stove less." 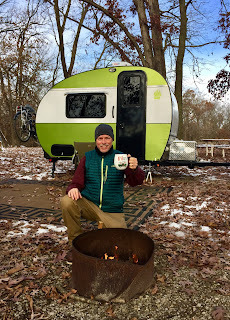 "2019 is going to be a 'acid camping test' for myself, my TV, and my Kodiak: I’m currently camping full time through the winter in Florida; come spring I head west to the California coast; north to the Canadian border; east to the Rockies; south through the Rockies in the fall; then back east to the [RTTC] reunion; after that I head north through New England, and then back south to Florida by next winter. Good Lord willing and 10,000 creeks don’t rise! By 2020 I’ll either trade the Kodiak (what’s left of it?) in on a pocket-cruiser boat and do the Great American Loop cruise, or just collapse for a year back on the farm in Missouri. If nothing else, its gonna be an interesting year!!" New Year's resolutions for some centered more on time rather than geography. Camp "a lot more" was a common refrain, but some were very specific, such as "I'd like to try to have a camping trip somewhere at least once a month." Kevin Ford even said, "200+ nights in my teardrop." One teacher plans to fit camping to her schedule: "My goal is to explore some place new at least once each month. Plus, I want to do three Big Adventures this year. I'm a teacher, so that will mean spring break, Christmas break, and a Grand Adventure over the summer." Getting off the grid and bookdocking was a goal shared by a number of campers. The first mention I read was a sort of Twilight Zone comment of "Boon-dock in a ghost town." Now that certainly sounds interesting. 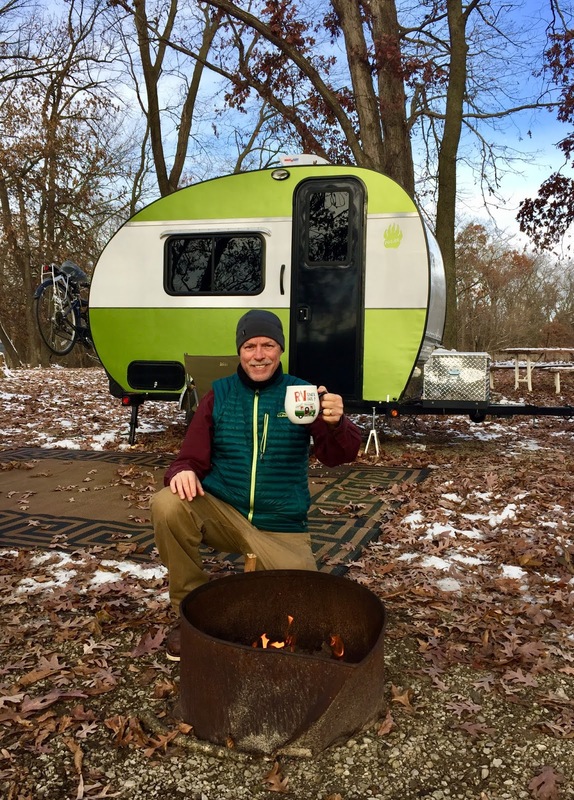 Cam Lindblade channels Star Trek camping for 2019 by saying, "To seek out and explore new and free campsites that are not part of campgrounds!" I hope he boldly goes where no one has gone before, because such exploring is not so easy all the time, as Michael Crosby explains: "Living here in the southeast most campgrounds fill up months or a year in advance for the more popular parks. Very few places to boondock anywhere. I'm so jealous of those who live out West with all the public lanes to just get out and go. I need to do a better job of planning far in advance to book sites; it's just difficult to plan in advance with my type of career and a young child. So my goals for 2019 is to make an effort to find some boondocking places, even if it means cancelling the trip if I can't find an open spot, and making an effort to book sites far in advance and cancelling at the last minute if plans change." Resolutions for some campers focused on people, rather than places or things. One grandmother wants "to get our 10 year old grandson to like camping." A mother explains her family goals: "I will be seven months pregnant in March when camping season begins for us. My husband and I have two other sons, and they will be almost four and just turned two. So my resolution is to just get my pregnant self (with husband) out there with two small children before baby is due in June and then to take all three before summer’s end." This is a brave and noble goal, especially with a tiny trailer, although I imagine there will also be a tent somewhere in the mix. A people-oriented resolution that probably resonates with many campers was articulated by Jim Cook: "We have made some friends through our interest in camping with our teardrop. Our hope is to meet more teardrop campers, make more friends and get to enjoy camping with our friends more this coming year." Well said! "As I head out cross-country again in January, I will protect my healing process with lots of sleep and great nutrition, but I am determined to spend more time sitting outside with an inviting table and a couple of empty chairs, and try to learn habits of hospitality, becoming a listener, cherishing other travelers and their lives. These are logic goals right now; I long to sculpt them into heartfelt, soul-nurtured, soul-nurturing ways." Something new that I learned from researching this article is the existence of a tiny trailer social group called Tearjerkers. Below is information about this group from their online "About" page. TEAR JERKERS was formed in late 1997 by Todd Brunengraber with assistance from Grant and Lisa Whipp of Tales & Trails/Teardrop Times. Our group encourages and supports membership in TEARDROP TIMES, the international fellowship of Teardrop Trailers. Our members include owners, home builders, manufacturers, restorers, parts suppliers and creative craftsmen that build their own from scratch. We enjoy not only our small vintage trailers but also, vintage vehicles to tow them with. TEAR JERKERS started out on the East Coast of the U.S. but, has expanded to include members from Great Britain, Australia, New Zealand, Finland, Sweden, Canada, and The Netherlands. TEAR JERKERS is an informal group of people who share their love of Teardrop and small Travel Trailers through discussions & Gatherings. "If you enjoy the great outdoors and fellowship with others, our campsite will always be open." One does not have to be a member to attend our Gatherings. Let us make no mistake, TearJerkers does "Group Camping". Our gatherings are Social Events with lots of interaction and activities. If Camping in Solitude is what your looking for, Maybe a TearJerkers Gathering is not for you. This informal group was mentioned by a couple of our own tiny trailer campers, with one person even being a gathering host. 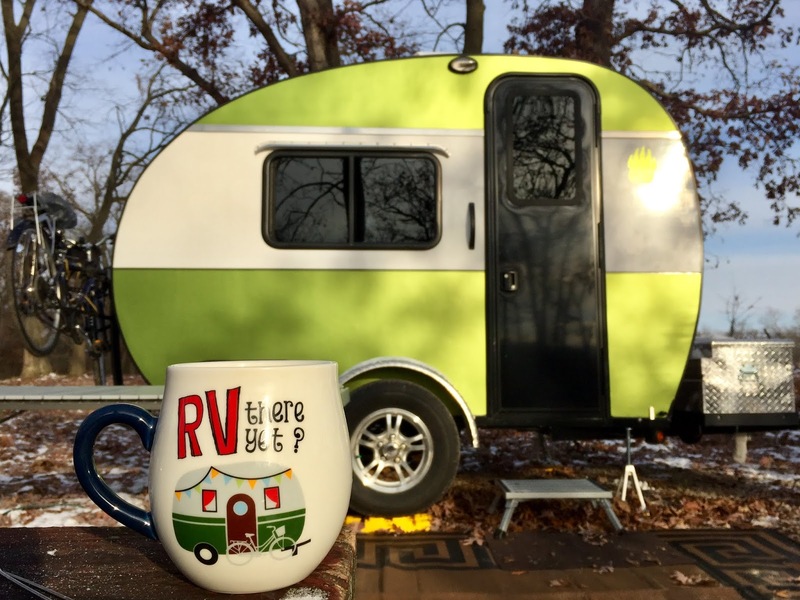 Although I tend to be a more "camping in solitude" camper, my experience online and in campgrounds is that tiny trailer campers are good folks to be around, so you might want to check these gatherings out, which happen all over the United States, and in fact are worldwide. I'm impressed with all the wonderful resolutions of tiny trailer campers that I've interacted with online. They are inspiring! It seems only fair to now share my wife and my resolutions, which are very simple. We want to find campgrounds where we can "settle in," spending more time hiking, bicycling, cooking over the campfire, and playing with our grandkids. I suppose you can say that we want to feel more at home where we camp, spending longer times at one place and delving more deeply into the local geography and history: Indian mounds, fossils, nature trails, and campfire recipes and cast iron cookware. Happy camping in 2019 to everyone, and thank you to all those who contributed to this article. Remember that the best way to consistently receive these posts is to subscribe to this blog by signing up at the spot on the sidebar to the right. Then you will receive blog posts as emails and can either read as email or follow a link to the blog. (I prefer the latter because it's more visually appealing.) However you choose, Green Goddess Glamping wishes you all a fun year of camping. Green Goddess Glamping wishes everyone the happiest of holidays and a wonderful new year filled with great camping adventures! Sung to the tune of "The Chipmunk Song (Christmas, Don't Be Late)"
And some Christmas tiny trailer camping photos via FB's Teardrop Trailers Lovers group. Thank you, Charlie Knight! 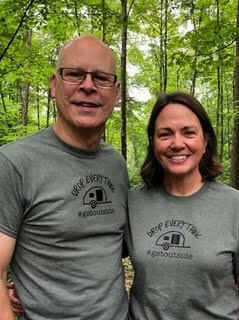 With seven years of tiny trailer camping behind them, Ruth and Greg Seubert are a reservoir of knowledge, experience, and great stories. 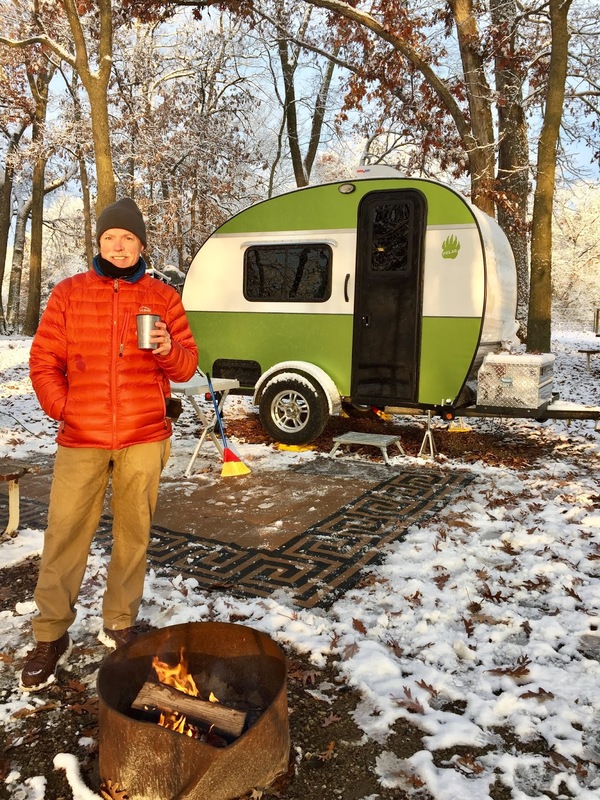 Hailing from central Wisconsin, the Seuberts are in the process of fulfilling our shared camping dreams of good times in nature--specifically for them, to visit "as many national parks as we can. We’d also like to visit all the state parks in Wisconsin." 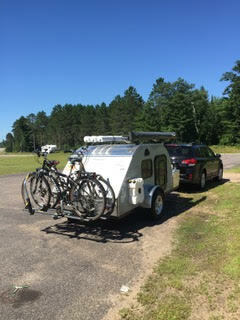 Pulling a 5x9 TC Teardrop with a Subaru Outback, their tiny trailer experience began with a TC Teardrop 5x8 in 2011. After that foundational experience, they moved on--or up. "After 4 years we decided to upgrade and purchased a new 5x9 model." Their original tow vehicle was a Honda minivan, but for the last five years they've had the Outback. "There have been no issues pulling the teardrop. You tend to forget it’s back there!" Like many tiny trailer owners, the Seuberts were not new to camping when they entered the tiny trailer community. Ruth writes that she grew up with nine brothers and sisters, and they tent camped. Her husband camped with his family in a homemade trailer. 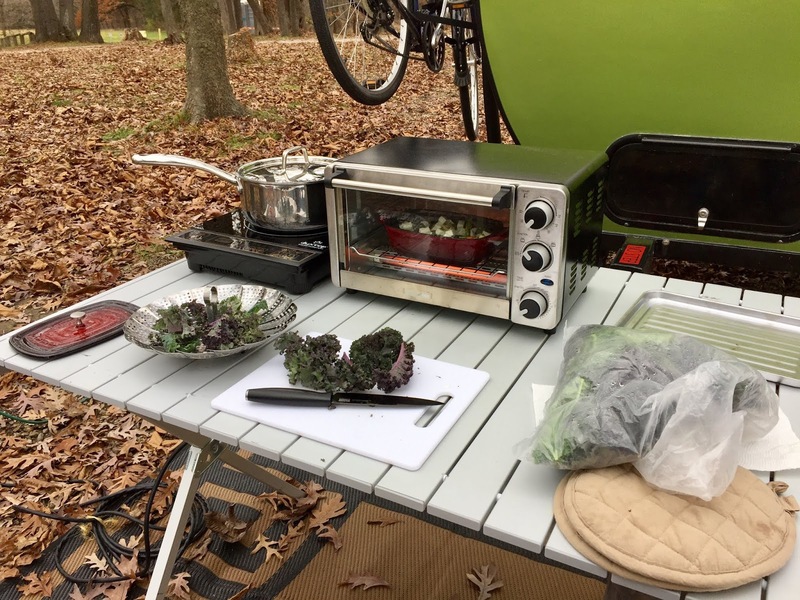 "With our three kids we tent camped and had a short stint in a pop-up camper that we decided was too much work and went back to tent camping. We really like the simplicity of the teardrop. It’s a wonderful step up from a tent, yet is still minimalist." Ruth and Greg's camping year tends to run around 35-40 nights a summer, "sometimes more if winter doesn't hit too quickly." State campgrounds are their favorite, although they camp at a county park every once in a while. "We haven’t really camped off the grid, but we don’t hook up to water or electricity regardless of location." Favorite camping spots are "definitely the woods near lakes," which means Ruth and Greg must often be happy campers, since central Wisconsin has a lot of wooded waterways! "We have camped on the prairie in North Dakota and in Smokey Mountain and Grand Teton national parks. Bayfield, Wisconsin, on Lake Superior is one of our favorites, along with Copper Harbor, MI, on Lake Michigan, and Door County, Wisconsin. 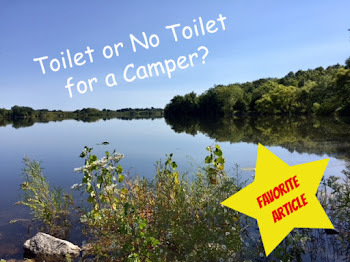 Our all time favorite is a state campground an hour away! The fall is definitely our favorite time to camp! No bugs, and far fewer people. We enjoy the cooler temperatures, beautiful colors and hiking. Nothing beats a warm fire on a chilly evening." Years of camping must provide many great camping stories because when asked to tell a favorite, Ruth's response was "Just one? Yikes!" 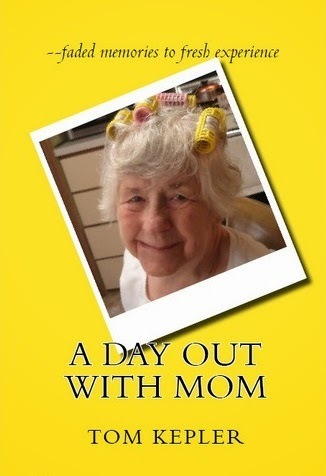 One of the funniest she remembers was when they were camping in Copper Harbor. 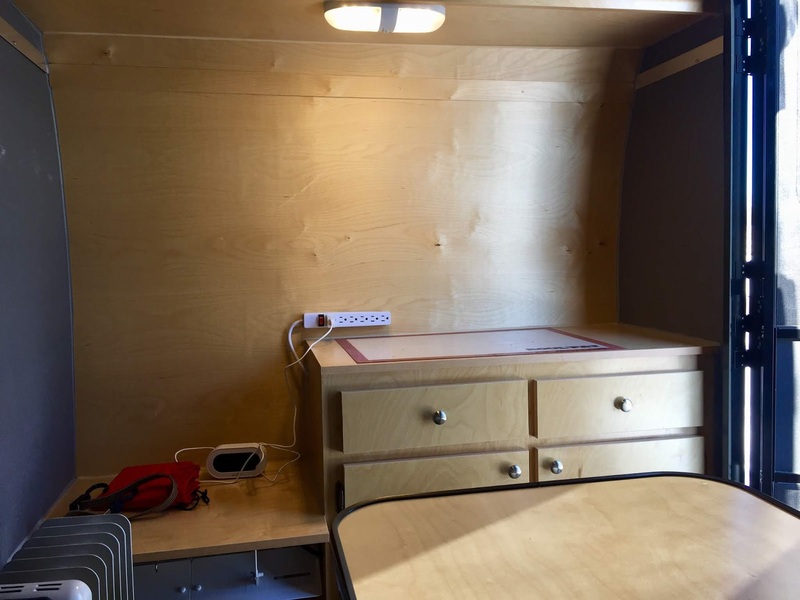 "At one point we had three other campers in our site asking questions about the teardrop. A young man said his wife was so embarrassed by him coming over to talk to us! But eventually she showed up, too!" She also remembers when "in the Grand Tetons we had two bears walk right through our site the first day we were there! And camping on the shore of Lake Michigan in the UP was amazing." 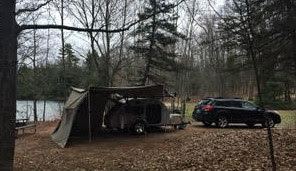 Michigan sounds like a destination to add to the camping list! The Seuberts are pleased with their current trailer. "We have actually made no major modifications to the TC Teardrop itself, but we’ve added a few options over the years. A Rhinorack Foxwing awning was an investment that we love, along with the Rhinorack Sunseeker Awning and Base Tent. 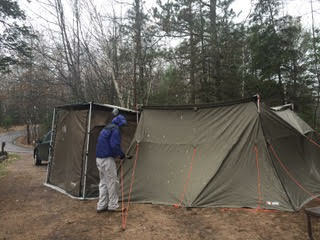 The tent attaches to one of the side doors, and is all enclosed with a floor and zipped screening. It’s perfect for getting in out of the rain, away from mosquitoes, changing; and it houses our clothes, a couple chairs, and port-a-potty. We also added 4 Rotopax water containers, which eliminates the trips to the water pumps in campgrounds, and a RoadShower. Based on their years of camping experience, the best advice the Seuberts can give is this: "Embrace the outdoors!" Living in in human-made boxes is just too limiting. 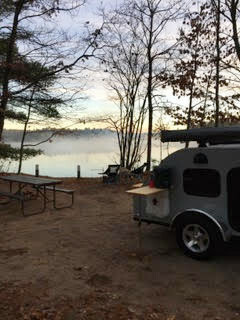 "When we decided to upgrade from tent camping, we went to a dealership to look at small pull-behind, hard-side campers. We stepped inside the first one, saw the stove, refrigerator and microwave, and knew that was not what we wanted. So often we see people with the large RV’s, and they are inside! Get outside! Cook over a campfire! Hike the trails! We climb into the teardrop after a long day, and head back out in the morning." Ruth and her husband like the minimalist nature of tiny trailer camping, and not only are teardrops "minimalist" but also require a certain less-is-more attitude toward gear. Ruth advises to "pack minimally. It reduces the weight you’re pulling and makes it easier to find something when you need it. The only things we need to pack/unpack for each trip are food and clothes. Otherwise, everything stays in the galley and lockbox at all times." Ruth and Greg hope that retirement is just around the corner. Their teardrop has already provided them with a wealth of memories, and they hope it will last a long time and provide more great memories. We thank the Seuberts for sharing their tiny trailer camping experiences and providing us with future hopes and possibilities. How Does Vogue Magazine View Glamping? We all know of Vogue magazine, the fashion magazine, the one with beautiful, glossy photographs of beautiful people wearing beautiful, expensive clothes. If Vogue publishes an article about glamping, then that will really be the genuine article Glamping with a capital G.
I read the article (Is Glamping Camping? Wild's Cheryl Stray Tackles the Question--In Style) and then bookmarked it and set it aside. Yes, glamping for Vogue is a luxury resort in a northern Colorado that includes massages, lessons on fly fishing, gourmet meals--and for author Cheryl Strayed, lots of time alone, which was what she was looking for. Cheyrl Strayed's 1,100-mile trek from Southern California to the Oregon-Washington border was a kind of rebirthing experience for her to start her life anew, to find her own steel and strength in a trying time. 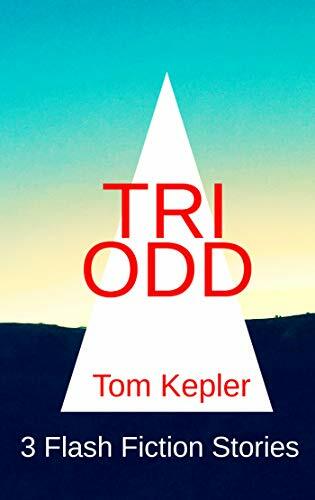 I'm putting the book on my to-read list for this winter. In the prologue of the memoir, she finds herself on the PCT after a month . . . with no shoes. During a rest break, her backpack tips and pushes one shoe off the steep trail and down, down, down into a canyon, irretrievable. She gasps, realizes the one hiking boot she is now clutching to her chest is useless, and pitches it into the sky where it falls into the lush trees below. "I was alone. I was barefoot. I was twenty-six years old and an orphan too. An actual stray . . ."
This is the woman, twenty-three years later, who goes glamping for Vogue. What does she have to say? Well, she states that her main feeling about glamping was that she felt a bit snobbish about the whole idea. It’s to challenge oneself by going outside one’s comfort zone—and getting comfortable there. It’s to scare oneself and make oneself brave. It’s to experience the deepest silence, out of which rise the most insightful thoughts. And perhaps most important, it’s to give oneself the opportunity to tap directly into the profound understanding that under these vast stars we—humans, plants, and animals—are all connected. Glamping, she says, is a bit more of bringing civilization to the wild, rather than stripping ourselves bare to our spiritual roots. For Vogue, she puts herself to the glamping regimen: stretching, yoga exercises, which she hasn't done for years; catch-and-release fishing for rainbow trout; hiking with the owner's hunting poodle, Toby, where she begins to connect with the land, sensing its "history, imagining the cowboys, miners, and homesteaders who lived here long ago, and the native Ute people before them." She does have a good experience as she ends her last evening at the glamping resort. "As I gazed up at the stars I realized I felt slightly altered from the version of me who’d stood here a couple of days before." It's an experience, she realizes, that can't be captured with her iPhone camera, but can "only be felt." In the end, it is not how austere the camping experience is, as when she hiking the PCT, or how luxurious the camping experience is, as when glamping at a mountain resort. It's about taking our lives into nature, whether it be forest, prairie, ocean, or desert. It is about reminding ourselves about rhythms more complex and grand than our usual daily routines. 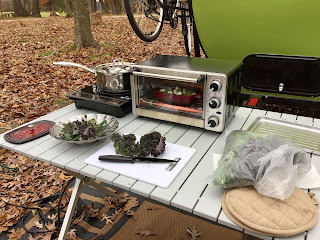 So my tiny trailer, the Green Goddess, and my humble blog, Green Goddess Glamping, seem to be my comfortable, thoughtful means, as author Cheryl Strayed has done, to "connect with the land" and feel "a slightly altered" version of me, a simpler and more uncluttered self. "Glamping" may be different for everyone, but we should find a way to be comfortable and at home in nature, for ultimately that means being comfortable and at home with ourselves, for we are as much a part of nature as that Douglas fir or that Stellar jay or that cloud billowing in the sky. That is the ultimate "glamping," I think, to in some way remember the dignity of our true selves, to remember our place in the universe, to be comfortable with the silence that lies beneath the water sounds of a mountain stream as it sings its way down the mountain. We are not just work horses or riding ponies. We are more than what we do and what we own. We are not just clothes horses. Even Vogue magazine recognizes that! Beneath all our busy routines lies the silence of nature, the green goddess. We yearn to be comfortable in that, with that. Glamorous camping--yes, let the snow fall as I stand beside my tiny trailer, awash in the silence of the moment, comfortable and secure, and more than anything, at home so that wherever I camp, everything is exactly according to its nature, including me.